Dominant Life Form: Araknoids (spider-like semi-humanoids). 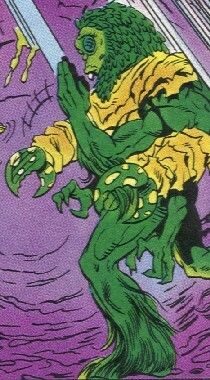 The Araknoids possess six arms and two legs, with at least four eyes. They can spray webbing from their mouths, as well. They may or may not have a chitinous exo-skeleton. They speak via a system of clicks, and can only communicate with humans via a two-way translator device. They are disgusted by the appearance of humans (two-legs, they call them), and can hardly stomach the thought of touching one. 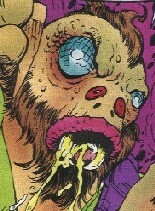 The Araknoids had a variety of appearances, perhaps indicating various sub-species or races. (Knights of Pendragon II#6 (fb)) - The world of Arakne was defended by the Paladin, a group of heroes representing their world's counterparts to the Pendragon. It had long been a world of peace and beauty that the heroes had become somewhat lax and careless. They lived lives of harmony and enlightenment high in the cathedral mountains. Then one day the Warheads Kether Troop came to Arakne, seeking the power of the Nucleolus. Sent by Mys-Tech, the Warheads (whom the Araknoids referred to as the Ravagers) slaughtered the Araknoids, looting, burning, and killing everywhere they went. A number of Araknoids fled deep into the caverns below the Nucleolus. A "Crisis-Conflab" of the Praetorium (ruling council) was convened. The vice-praetor Malekyth sent the full force of the Paladin Corps against the Warheads. In a conflict that raged for weeks, the Warheads wiped out the Paladin, leaving Arrakhyl the sole survivor. (Knights of Pendragon II#6) - Arrakhyl only survived by the use of his trans-shift device, which briefly sent him to Earth-616. He encountered the black-costumed Spider-Man, who mistook his intentions and fought him. 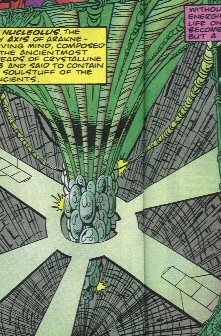 Arrakhyl teleported to Avalon, where he entered the Green Chapel, the base of Earth-616's Knights of Pendragon.. The Green Knight communicated the plight of Arakne to the Pendragon Albion, who gathered the other Knights of Pendragon to Avalon. Mistaking the Knights for the Ravagers, Arrakhyl attacked them, until Albion recognized Arrakhyl as a Pendragon and stopped the fight. Arrakhyl detailed the recent tragedies to the Knights, who recognized the Ravagers as the Warheads. (Knights of Pendragon II#7) - Arrakhyl led the Knights to Arakne and then to the Nucleolus, where they found the Warheads who overpowered them and drove them off. Gawain was blinded in the struggle, and Crown fell off a bridge into the deep chasm below. Arrakhyl brought the remaining Pendragon to the Goassmer Tower, hoping to find any surviving Araknoids, and they found Malekyth--who had become Praetor with the death of his former superior--and his guards. When the Knights noted the resemblance between Arakthu (the god of the Paladin) and Earth's Spider-Man, Malekyth and his agents--secretly members of the Scourge--teleported to Earth, hoping to slay "Arakthu" and offer his corpse to their god, Tarashk. Half of the Pendragons (Albion, Grace, Union Jack) followed the Scourge to Earth, where they joined with Spidey against his attackers, while the other half (Gawain and Breeze), along with Arrakhyl stayed behind to prevent the Warheads from taking the Gossamer Tower as well. 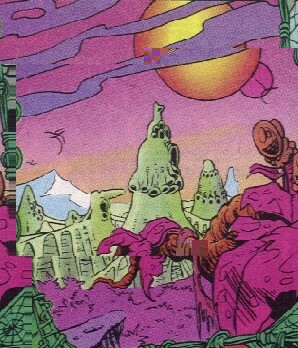 Crown survived the fall by landing on the soft webbing in the caverns below, and he was found by the Spiridkin, the Araknoids who had fled from the Warheads. (Knights of Pendragon II#8) - Spidey and the Knights drove off Malekyth and the Scourge, who fled back to Arakne. Spidey joined the Knights in returning to Arakne to save it from the Warheads. Arrakhyl and the others explained to the Warheads that the Araknoids were intelligent and that stealing the Nucleolus would kill them. Three of the Warheads (Liger, Misha, and Stacy) joined forces with the Knights, while the other three Warheads (Evone, Grierson, Prizzi) teamed up with Scourge. Crown rallied the Spiridken to return to the surface and fight for Arakne. The Scourge fought both groups of heroes, and when Spider-Man's group began to gain the advantage, Malekyth activated a timebomb which would destroy the Nucleolus (and herald the return of Tarashk), and he then assumed his more powerful form and joined the battle. (Knights of Pendragon II#9) - Crown and the Spiridkin joined Arrakhyl, Gawain, and Breeze in routing the Scourge. Spidey and the other Pendragon combined their power to knock Malekyth into the caverns below the Nucleolus, and they cast his bomb into Ley Space, where it exploded harmlessly (or so it seemed, see comments). Liger slew Grierson and Evone and Prizzi in fell in battle as well. 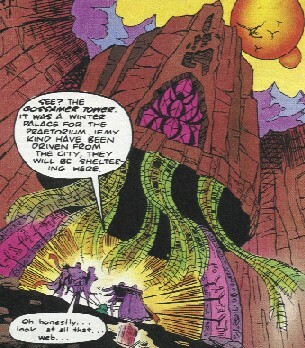 The Spiridkin searched the caverns for Malekyth to try to finish him off while he was weakened from the fall. Having felt the power of the Green Knight, the Spiridkin became the basis for a new Pendragon corps, serving and training under Arrakhyl. In addition, the Araknoids repaired Gawain, restoring his vision and giving him a new face plate in the process. Comments: Created by Dan Abnett, John Tomlinson, and Alan Davis. The Araknoids refer to their allies as Palp-Kin. The bomb hurled into Ley Space by the Pendragons entered a portal to the dimension of Earth-313, destroying much of that world. The Lemurians of that world later came after the Pendragons of Earth-616, seeking vengeance. A nucleolus is a condensed mass of chromatin (DNA-type material) within the nucleus of a cell. There can be many of them. 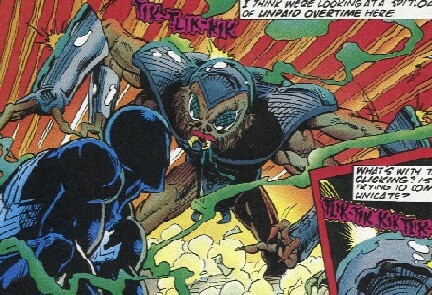 Spider-Man wanted to see if there was some connection between himself and Arakthu, who was of a similar appearance to his, or between Venom and the Scourge, who also had a similar appearance. Ultimately, Spidey decided it was just coincidence, but Albion reminded him that patterns repeat through space and time, and that perhaps he and Venom were somehow tied to Arakne's mythology. These repeating patterns can be seen on Earth-616, with common themes and characters showing up between the Greek and Hyborian eras, as well as the modern era and various futures. 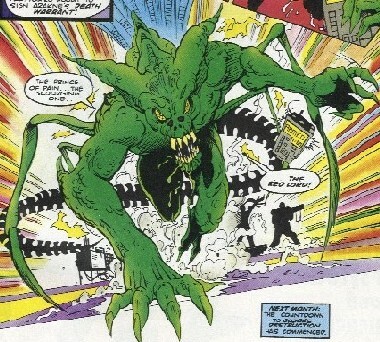 I'd love to see JMS use the Araknoids over in Amazing Spider-Man, maybe even in a story where the Scourge joined forces with Omm. The spider-god of the Paladin, it is unclear whether Arakthu was an aspect of the Green Knight, an agent of the Green Knight, or Arakne's counterpart of the Green Knight. It was apparently very similar in appearance to Spider-Man, in his standard red costume. He was only mentioned, and his symbol was seen in the stained glass window of the Gossamer Tower. The sole survivor of Arakne's Paladin Corps, he escaped the Warheads by teleporting to Earth-616. There he encountered Spider-Man, who mistook his intentions and fought him. 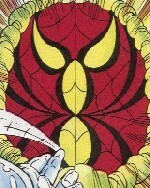 As Spider-Man was wearing his black costume at that time, Arrakhyl made no connection between Spidey and Arakthu. Traveling to Avalon, Arrakhyl initially attacked the Pendragons, mistaking them for more Warheads. After this, he joined with the Knights against both the Warheads and the Scourge. Fighting alongside Gawain and Breeze, he helped to defeat their common enemies, and then he began to train the Spiridkin to serve as the basis for a new corps of Pendragons on Arakne. Breeze was initially mortified by his appearance, but she eventually warmed up to him and even kissed him on the cheek when the Pendragons left his world. Arrakhyl nearly vomited when she kissed him. Arrakhyl is a courageous fighter, and skilled in hand-to-hand combat and with the use of a sword. The winter palace for the Praetorium. Malekyth and the Scourge made this their base after the Warheads slaughtered many of the Araknoids. When the Scourge went to Earth, Arrakhyl and the Pendragons held the Tower. The leader of Arakne's Scourge, he had also made his way to Vice-Praetor of the ruling council of Arakne, the Praetorium. It was Malekyth who directed the full force of the Paladins against the Warheads, presumably hoping that the two groups would wipe each other out to ease the way for the Scourge to then overrun the planet. His unnamed superior was presumably slain in the initial Warheads assault, as he was referred to as Praetor when the Pendragons encountered him. His true nature was revealed when he led the Scourge to Earth in an effort to slay Spider-Man, whom they believed to be an incarnation of the Paladins' god, Arakthu. Grace recognized the scent of the Bane on he and his compatriots. He and his agents were driven from Earth by Spider-Man and a contingent of Pendragons, and they returned to Arakne. They then assaulted a group of Warheads (Evone, Grierson, Prizzi), defeating and capturing them. Malekyth offered the captured Warheads the opportunity to survive if they agreed to join forces with them against the Pendragons and the other Warheads, who had joined forces with Arrakhyl and the Pendragons. 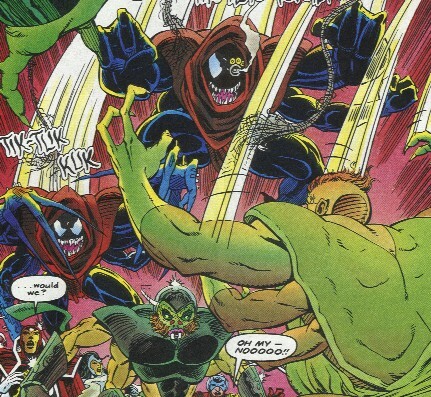 He sent the Scourge to attack their enemies, but Spider-Man and the other half of the Pendragons arrived to fight he and his new allies. Malekyth then activated a timebomb attached to the Nucleolus to pave the way for the return of Tarashk. He then metamorphosized into his more powerful form and fought his attackers. Eventually the combined might of the heroes knocked him into the caverns far below the Nucleolus, and the Spiridkin headed down there to find and destroy him. His bomb was cast into Ley Space by the Pendragons, and the Nucleolus was saved. Aside from having the legions of the Scourge to serve him, he could also transform into a giant form, perhaps 20 feet tall, and possessing superhuman strength (Class 75 or 100) and durability. He could presumably spin webs as well. The very axis/heart of Arakne, it is a living mind, composed of the ancient-most threads of crystalline webs and said to contain the soulstuff of the ancients. Its power was required to keep the world of Arakne hospitable to life. Without its nourishing energies, Arakne would be uninhabitable within a few seasons. Its power was sought by Mys-Tech, who sent the Warheads to obtain it. Malekyth sought to destroy it in order to pave the way for the return of Tarashk. When Liger, Misha, and Stacy joined forces with the Knights of Pendragon to defend the Arachnoids, the other three Warheads, Evone, Grierson, and Prizzi turned against them, hoping to gain the wealth they could obtain by selling the Nucleolus, and willing to slay their former allies to do so. Arakne's Pendragon Corps, they had grown soft after many years of peace on Arakne. They were slaughtered by the Warheads, and only Arrakhyl survived. Malekyth and the Warheads were defeated with the aid of Earth-616's Spider-Man and the Knights of Pendragon. The Spiridkin then became the next generation of Pendragons on Arakne, under the leadership and training of Arrakhyl. Worshippers of the unseen demon/dark god Tarashk (aka the Scourging One, Scourge, and the Prince of Pain, a possible counterpart of the Red Lord, or possibly the exact same being as the Red Lord of Earth-616), they were the counterparts of Earth's Bane. They have long been enemies of the Paladin, but were defeated by them in the distant past. The remaining Scourge continued to exist in the shadows, and one of their number, Malekyth achieved the rank of Vice-Praetor while keeping his true allegiances secret. After the Warheads slaughtered a large percentage of the Araknoid population, the Scourge began to act more openly. They tried to slay Earth-616's Spider-Man, whom they believed to be an incarnation of the Paladin's god, Arakthu. Failing this, they attempted to kill the Warheads and Knights of Pendragon, and Malekyth attempted to destroy the Nucleolus. They were defeated (and many slain) by the combined forces of Arrakhyl, Spider-Man, the Knights of Pendragon, and the Warheads Liger, Misha, and Stacy. Besides Malekyth, Tanakyth was the only other Scourge identified by name. AKA the Traveling Ones, they fled into the caverns below the Nucleolus when the Warheads attacked. They had apparently spent time in the caverns before when they had fled there to escape the cruel edicts of Vice-Praetor Malekyth. They were found by Crown, who led them back to the surface, where they served as the cavalry in helping the Knights of Pendragon in defeating the Scourge and the Warheads. After this they became the new Pendragon core, serving and training under Arrakhyl. Only Rikskath, their spokesman, was named (it is he that is pictured here). One of the Scourge, he criticized Malekyth for his failure to capture Spider-Man (whom they believed to be Arakthu).